Hope springs eternal on Opening Day, so the adage goes. Anything is possible. Even sunshine. After an interminable winter and two days of the dreaded wintery mix, Monday dawned with bright skies, moderate temps and a brisk breeze. Spring and the Orioles are back. 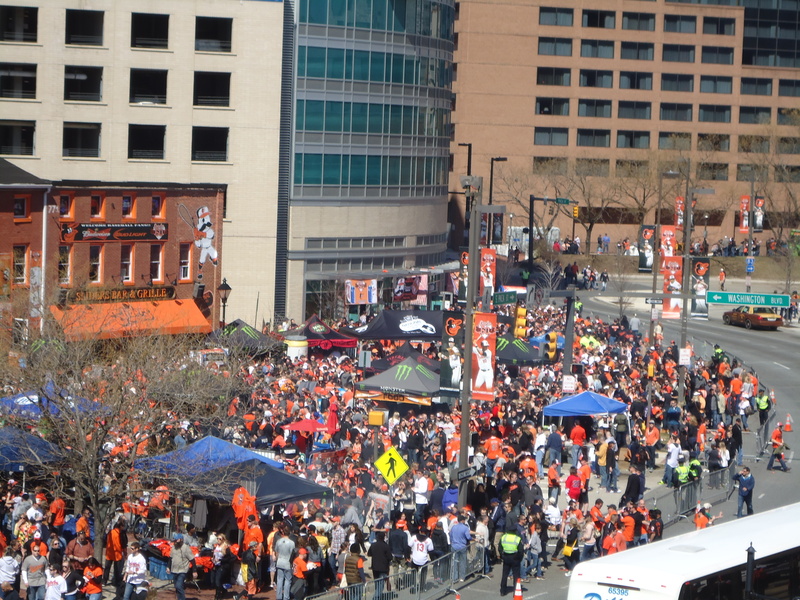 Even before the faithful flock to Camden Yards, Opening Day is underway. The grounds crew, led by Nicole McFayden, makes sure every blade is in place and every basepath smoothed to perfection. Hard to imagine after the mercurial weather of the past few weeks, but the field looks perfect long before the morning interviews begin. Concessionaires begin food preparation when most of us are having our breakfast. 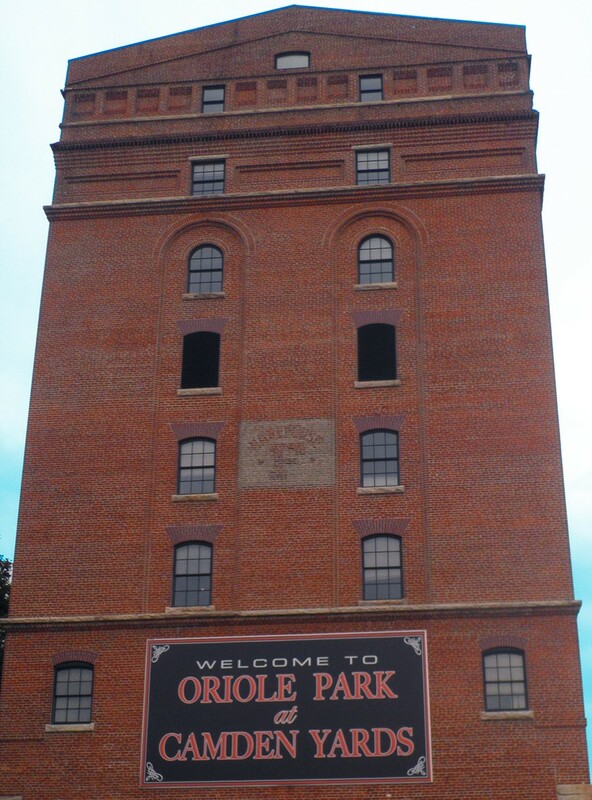 One of the delights of Camden Yards with its urban location is that you can smell the ballpark long before you see it. I caught the first whiff of Boog’s barbecue before crossing Lombard. The aroma of peanuts and cotton candy from the stadium concourse greeted the throngs arriving by light rail. With the opening pitch scheduled for 3:05, that leaves plenty of time for the popular practice of pre-gaming. In the spirit of the season, the faithful flocked to the traditional block party that takes place along Washington Boulevard from Greene to Pratt Streets. One of the local favorite establishments started breakfast (and beverages) at 5:00 am. Someone in that early crowd thoughtfully provided Brooks with a personalized #5 scarf. His gold glove has also been recently burnished so it glistens in the morning sun. The giant replica of the Star-Spangled Banner that provides the backdrop for the opening ceremony is carefully unfurled in a Warehouse corridor. The 200th anniversary of the Battle of Baltimore, which inspired Francis Scott Key to write the national anthem, is in 2014. This particular flag will see a lot of traveling during the bicentennial celebrations. When the gates opened at noon, everything was in place. Since the game was a sellout with standing room only tickets, there was a rush to snag popular viewing areas in Flag Court and the centerfield deck. These filled long before most fans arrived. One amazing observation. Despite the fact that today’s opponent is the World Champion Boston Red Sox, their usual ubiquitous fan base is largely absent. The stadium is almost entirely orange and black. And vocal. No doubt about this partisan crowd. They bought the tickets before the Fenway Southies had a chance. Here’s one of the few who did. Pageantry, ceremonies, tributes, and nostalgia. All part of Opening Day. But when the first pitch is thrown, it’s just about baseball. Again. Another season underway.